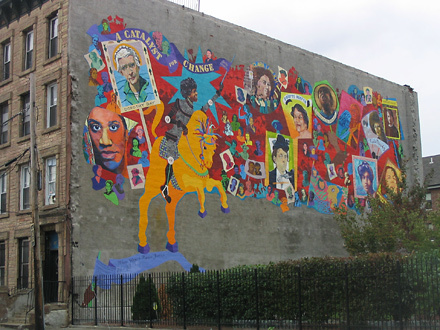 Neighborhood mural titled "When Women Pursue Justice"
It’s been almost(? only?) two weeks and I’m still waiting to get to the …plus c’est la même chose half of that saying. I don’t quite feel like I live here yet. It feels more like an extended vacation or something. Still living out of boxes; still need to go buy a new couch (more on that later); still haven’t really cooked much of anything yet (not that I cook much anyway when it’s nearly 100° outside like it was yesterday). That being said, I really love it. Like, really REALLY love it here. I feel a bit like… okay, you know when you start dating someone new, and you’re so crazy into him/her, and you want to tell everyone you know, but at the same time you’re afraid you’ll jinx things somehow or find out s/he’s not that into you after all? It’s like that. For instance, the three of us were walking home from the subway last night (after witnessing an incredible display of lightning — I know it was the same lightning I would have seen in Washington Heights, but man, there’s just so much more sky here, it’s crazy). As we were heading down the street, a girl and her mother passed us going the other way. “Hi, Trixie!” the girl called out from under an umbrella and waved. My kid looked momentarily startled and then replied, “Oh! Hi!” and then waved back. Reader, I could have cried. So… maybe this was just a fluke and maybe I’m jinxing myself by even talking about it. Maybe this sort of thing will never ever happen again and I’ll look back on that instance and wonder what went wrong. I am SO happy for you! And don’t worry … I don’t have a couch yet either, and it’s been, what? Over four months? But I’m getting there … and so will you! I think we’re going to get a couch next week sometime (probably this one? I dunno yet). I have really very little talent for home decor stuff — really almost none at all, honestly, so this will be an adventure. Very, very, very cool, Kristen. Trying to think of something witty to add, but it’s so not needed here. Just cool. Oh, that’s awesome! I love Brooklyn. If I ever move to New York, I think that’s where I’d have to go. So neighborhood-y. A different feel from Manhattan, in such a good way. Your heart rate slows a bit in Brooklyn.